There is a popular misconception among many producers and viewers of the almost ubiquitous TV programmes on ‘Ghost Hunting’ that old buildings such as castles and spooky looking houses are haunted. This is, I contend, a completely ridiculous idea possibly based on fabricated anecdotal accounts made by people with ulterior motives, possibly publicity seeking owners promoting their premises or production companies looking for a story. Imagine that you are a spirit, a ghost and your physical death resulted as you were decapitated in a sword fight in say Lancaster Castle during the English Civil War. Now, some hundreds of years later, you are in your spirit body and still walking round, minus your head in the spot where you met your nemesis. I mean would you really be doing that? It is a rhetorical question, you simply would not because when you, I or any other living being transitions from incarnate to discarnate form, we maintain our personality and are sentient. No sentient being, albeit one without a physical body, would knowingly spend hundreds of years ‘haunting’ the spot where they were killed, how infinitely dead boring would that be? My hypothesis is that, if we assume some anecdotal evidence is true and a ‘ghost’ has been seen, that vision is not a discarnate entity but a form of recording, rather like we watch an old video film playing back. I suggest that the occurrence of certain atmospheric incidences, such as dampness, darkness, cold wind and rain combine to trigger the ‘playback’ of the recording that has been captured within the molecular composition of the stones, the ground and other surrounding elements. If one reads about a few of the supposedly factual accounts of haunted houses it quickly becomes evident that most of these hauntings involve ‘ghosts’ that died horrible deaths. When a powerful highly emotional event takes place, such as a deliberate act of murder, it is my belief that the incident is effectively impregnated into the immediate material surroundings. Hence my contention that what witnesses to certain ‘ghost sightings’ are seeing is in fact little more than a natural reproduction of a long past event replaying as the atmospheric conditions support this. However there are numerous anecdotal reports of sightings where the spirit/ghost has interacted with physically incarnate individuals. 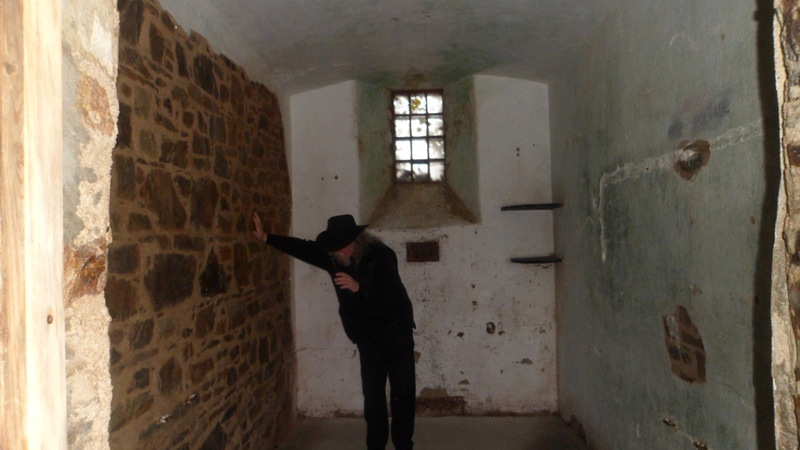 I am one such individual and here is a very brief summary of two of my paranormal encounters experienced during my time working in the dungeons of despair that are England’s aged gaols. I joined The Prison Service in January 1975 at HMP Strangeways located in the city of Manchester. This jail was built in 1868 and served as a place of incarceration and execution for the local area that was then Lancashire. Back in Victorian times when the prison was first commissioned the penal system included those sentenced to ‘Hard Labour’. The labour at prisons such as Strangeways included inmates being required to turn the handle of a device that looked somewhat like an old fashioned clothes mangle it was called a ‘crank’. The prisoner was set a daily target of the number of rotations he had to make usually over one thousand a day, recorded on an attached numerical counter. The Crank was adjustable and the pressure required to turn the handle was controlled by a screw at the top. Warders in charge of the prisoners had a key that enabled them to increase or decrease the tension making it harder or easier for the inmate to complete the rotations set as his daily task. Failure to complete the set number would result in punishment, often the sentence would be ‘Restricted Diet’ that consisted of just bread and water. The Crank and its adjustable tension screw are the basis of the etymology of the prison slang term for a Warder or Jailer i.e. Screw. Years later, long after the abolition of ‘Hard Labour’ and when I entered Strangeways, Prison Officers were still referred to as ‘Screws’. If anywhere in the darkness of that Victorian gaol was haunted, in the traditional sense that is sightings of the same entity repeating an event, then surely that place would be the execution unit. In Strangeways Prison those male inmates sentenced to death were held in a double size cell at the end of ‘B’ Wing on the ground floor or Landing 1. I first trod that dismal route, down the old iron stairs along B1 in the March of 75. At the time I had no idea that this was where one hundred prisoners had spent their final hours prior to being hanged in the execution chamber accessed at the end of the landing. What I did feel as I walked the cold stones beneath me was a sense of unease, a weird unsettling atmosphere seemed to permeate the place and it was cold. I found myself drawn to the cell at the far end of B1, looking inside through the ‘judas’ hole in the door I saw what I originally thought was a prisoner seated on his bed. A feeling of sadness came over me causing an emotional reaction, tears welled in my eyes I felt overwhelmed and drained of energy. ‘That is the old condemned cell’ a long serving fellow officer explained. I went to look again at the occupant but when I peered into the gloomy interior saw only a stack of mattresses and chairs. ‘We never use that cell’ the jailer spoke quietly ‘there have been reports that it is haunted’. On completion of my Home Office Prison Officer training I was posted to HMP Wormwood Scrubs in London W12. The Scrubs, as it is colloquially known, is another Victorian jail taking its name from the area on which it was built. Unlike Strangeways it is not designed as a panopticon but has four tall cell blocks A, B, C and D within a sixteen foot high wall. One evening I was detailed to be the Officer i/c ‘D’ wing which at the time, October 1975, contained numerous high profile inmates such as members of The Great Train Robbery gang. However when I took over the wing at approximately 9pm all the prisoners were locked up inside their cells. My duty was to patrol the wing and maintain security I had no keys just a walkie-talkie radio to call for help if needed. Each thirty minutes I had to punch a key in a switch at two centrally calibrated points one at the far end of D1 the other at the opposite end of D4. It was around midnight when I heard a bell ringing that is an inmate in one of the cells has pressed his alarm button. On investigation I found this cell was on D4 right at the end and I made my way there as quickly as I could. As I said I had no keys, all I could do was talk to the occupant through the door. I announced my presence and asked why he ha d rung for help. ‘There’s a woman been sitting on my bed Guv’ he replied. Now I knew this to be an impossibility, though I did feel uneasy hearing this as on my way up the metal stairs I had heard footsteps that seemed to be following me. I took some time to placate the troubled prisoner and as calmly as I could advised that there were no females in D Wing it was totally a male only jail. Once I had the man settled I went about my duty making a note of the incident in my report book. The next morning at approximately 6:30am I was visited by the Principal Officer i/c the prison and he asked me to explain why at 00:30hrs I had failed to punch my key into D1 check in point. I quickly explained what had happened and showed him my written report in the occurrence book. I told him how I had quelled the inmates’ fears by advising it was impossible for him to have seen a female in his cell as The Scrubs was a male only jail. The Principal Officer gave me a rather old fashioned stare ‘D Wing used to be the Female Prison. There were numerous suicides back in the 1950s and one woman threw herself off D4 landing when they took her child away for adoption. There have been many sightings of her ghost on and around this wing’.